Plan, construct, staff and maintain border command centers, conduct city patrols and engage in anti-smuggling investigations spanning nearly 2,000 miles of border. Do you have the intelligence and courage to handle the responsibility? Maintain traffic checkpoints, train sniffer and tracker dogs, and investigate smuggling operations. But are you able to do it all within budget? Use new technology to secure your borders - unmanned aerial vehicles, satellite surveillance, remote cameras, and helicopter patrols. Review your daily briefing to determine which threats pose the most danger to your border. Interrogate detainees in hopes to gain information about future plans of smugglers or terrorists crossing the border. Set an alert level based on the Homeland Security alert levels. 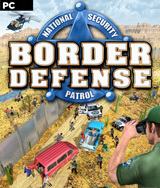 Increase the amount and level of agents patrolling the border at higher risk periods. Monitor the location of all your agents via the electronic satellite map and reassign any agents to new locations and patrol routes. Research new weapons and armor to outfit and arm your guards with top-of-the-line life-saving security. Construct, staff and enforce checkpoint gates, holding cells, command centers, medical centers, administrative buildings and more. Use technology to secure your borders. Set an alert level based on Homeland Security alert levels.